What’s more fun than a slide? Nothing, except for maybe a supersized version of the playground standby. Visitors to Miami‘s Aventura Mall get to ride exactly that. Designed by Belgian artist Carsten Höller, the 93-foot-tall pair of double-barreled slides run clockwise-counterclockwise, and can be ridden solo or with a buddy. 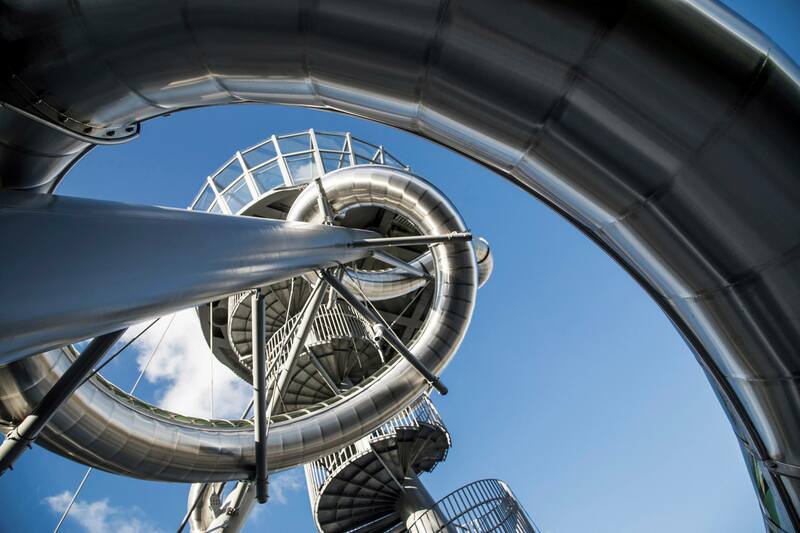 Visitors ascend a spiral staircase to reach the top of the slippery titanium steel slides, which whisk riders away at dizzying speeds, up to 15 miles per hour. With their industrial finish and slightly goofy steampunk massing, the slides look less Miami, more City Museum—but a whole lot of fun nevertheless. The slide-sculpture, officially Aventura Slide Tower, is part of the Aventura Mall’s recent expansion, a three-level indoor-outdoor space designed around experiential art from the likes of Louise Bourgeois, Jorge Pardo, Ugo Rondinone, and others. @chloessevigny & #carstenholler debating over which one of them won the race down the #aventuraslidetower!